For over 30 years, the Fuquay-Varina Junior Woman's Club has been devoted to serving our community and making a difference. The Fuquay-Varina Junior Woman's Club is a member of the national General Federation of Woman's Clubs (GFWC). Being involved with a national organization offers benefits to our members and our community. The Fuquay-Varina Junior Woman’s Club has 20+ members who work to enhance the community through their commitment of volunteer service, donations and/or monetary support to impact organizations such as Emergency Food Bank, FV Library, InterAct, Hand of Hope, Military Missions in Action (MMIA), Fuquay Police and Fire Departments, FV Parks, Read and Feed, and local elementary and middle schools. Through our fundraisers over the last few years, such as our annual Charity Ball, we have raised a total of over $60,000 for Fuquay-Varina and our surrounding communities. The GFWC-FV Junior Woman's Club was chartered in July 1987 with 25+ members. Our club spends over 2,000 hours per year helping our community. Whether it’s helping kids with Read and Feed, attending various local events or building ramps for veterans with MMIA, we are happy to serve. Each month the focus of our monthly membership meetings is one of the following Community Service Programs (CSPs). Each CSP Committee plans a project and a presentation that reflects policies of the GFWC and interests of Clubwomen. The GFWC Arts Community Service Program encourages members to promote and support arts activities in their clubs, schools, and communities. It is designed to inspire clubwomen and ignite within them a desire to make their world a more beautiful place. As Edgar Degas once said, “Art is not what you see, but what you make others see.” The goal is to create programs and projects that include music, literature, dance, drama, theatre, and other arts-related areas, both traditional and innovative, that cause the world around us to see and feel what they might have only once imagined. on less than $2.50 a day. Twenty two thousand children die each day from easily preventable diseases and over 600 million people do not have safe drinking water. The International Outreach Community Service Program is designed to give members the opportunity to become better world citizens and make an impact through education, advocacy, and action to affect change for others throughout the world. right. There are millions, the majority of whom are women, who lack opportunities to learn or have insufficient skills to be able to assert this right. The challenge is to enable them to do so. Literacy is also a catalyst for participating in social, cultural, political, and economic activities, and for learning throughout life. 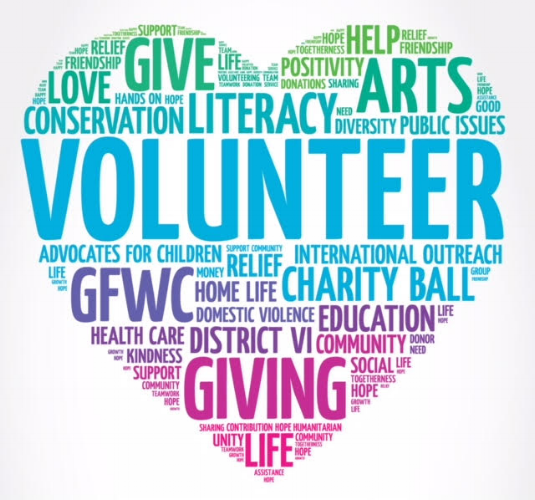 The GFWC Home Life CSP is designed to inform members of issues that affect the well-being of individuals, families, and communities by providing opportunities and resources to meet and address needs through volunteering. Through this program, clubs may develop and implement creative projects that promote a healthy lifestyle; increase awareness, prevention, research, and treatment of disease; target personal development; address the issues of hunger, inadequate housing, and homelessness; and/or prevent or correct financial difficulties. If you love your community and have a heart for volunteering, consider joining the Fuquay-Varina Junior Woman's Club at our monthly general meetings. Interested in a sponsorship, auction donation or attending our annual charity ball? Click below for charity ball information. Would you like to partner with us to do great things in our community? All contributions are tax deductable, Fuquay-Varina Junior Woman’s Club is a 501 (c) 3 non-profit organization tax ID #56-1565851.